At the beginning of the American Civil War, firearms of all types were in short supply. Many early volunteers were issued antiquated, imported, and nearly obsolete weapons as both sides strained to meet the demand for arms. Eventually, however, a few quality types were obtained in large numbers and became standard issue to the soldiers of both armies. While rifles were preferred for their long range and accuracy, many older smooth-bore muskets of foreign and domestic manufacture saw service as well. Chief among these was the 1842 Springfield. This weapon had a 42 inch long, .69 caliber barrel. It simultaneously fired one solid .69 caliber and three small buckshot. Produced until 1855 at Springfield, Massachusetts and at Harper's Ferry, Virginia (now West Virginia), 172,000 were made. Some of these (about 10,000) were later rifled in the pre-war period. The shot that killed Maj. Gen. John Sedgwick during the Battle of Spotsylvania Court House came from a Whitworth rifle at a distance of more than 500 yards. 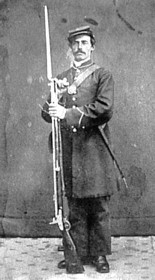 Sedgwick was the highest-ranking Northern officer to die on a Civil War battlefield. The identity of the Confederate sharpshooter who fired the fatal shot remains a mystery, although at least five Confederate soldiers later claimed responsibility. The principal shoulder weapon of the mounted services was a short-barreled carbine. These were effective out to 200 yards. Numerous designs appeared early in the war, and close to 20 different types were eventually adopted by Federal forces. They ranged from fairly simple single-shot breechloaders using a paper or linen cartridge and a percussion cap, to complex repeaters firing self-priming metallic cartridges. Calibers ranged from .44 to .54, and many carbines took specially made cartridges. Resupply of ammunition often proved tedious. As with the Springfield, the Confederates made their own copies of the Sharps, but demand far outstripped production. Only about 5,000 Confederate or "Richmond" Sharps were made. Of these, General Robert E. Lee wrote that they were "so defective as to be demoralizing to our men." Southern horsemen had to make do with captured Yankee breech-loaders, for which ammunition might be hard to come by, or stick with awkward short-barreled muzzle-loaders, for whom cartridges could be produced locally. A few Southern arsenals, most notably the Richmond Arsenal in Virginia, the Fayetteville Arsenal in North Carolina and the Cook & Brother Armory of Athens, Georgia, attempted to manufacture muzzle-loading carbines for Confederate troopers. Production was slow and erratic, and never met the needs of the men in the field. One such weapon was the Spencer, patented in 1860. Available in .52 caliber, it was capable of sending out seven aimed shots within thirty seconds. The effects of such firepower were overwhelming to Confederates used to the slower muzzle-loaders. Often, Federals with Spencers fired only one shot together to simulate a volley of musketry and waited for the Confederates to advance. When they did, the Unionists unleashed the other six shots in a rapid fusillade of fire that devastated the Southern lines. One Confederate observed, "There's no use fighting against such guns..." Over 94,000 carbines were acquired for use by Federal forces. None of them were used at Gettysburg, but the 5th and 7th Michigan regiments of General Custer's brigade were armed with the longer rifle version, and did good service with them there. 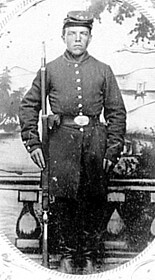 One Michigan trooper, Robert Trouax, later distinguished himself with his Spencer rifle at the Rapidan River, "killing six rebels as they were crossing the river". Another repeater held in high esteem was the .44 caliber Henry Rifle. Carrying 16 shots, it too put a Confederate opponent at a severe disadvantage. 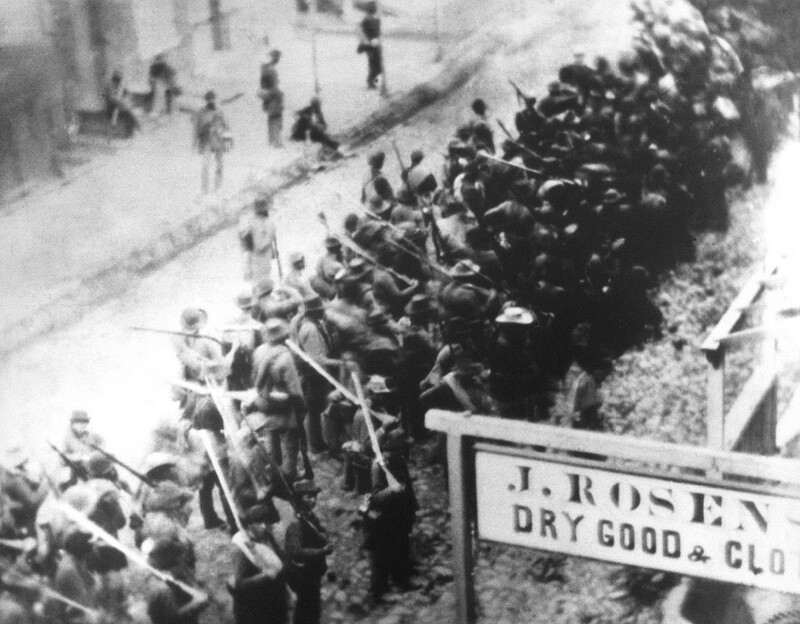 While only 10,000 Henry Rifles were made, and only 1,731 purchased by the government, their presence on the battlefield was felt by the Confederates. One of General William T. Sherman's soldiers stated: "I think the Johnnys are getting rattled; they are afraid of our repeating rifles. They say we are not fair, that we have guns that we load up on Sunday and shoot all the rest of the week." Civil War Soldier Firearms, Weapons, Small Arms. Common Civil War Soldier Firearms and Rifles. (About) Rare photo of Confederate soldiers armed with Pattern 1853 Enfield rifle-musket as they march through Maryland toward Antietam on September 12, 1862. LOC.gov. Many foreign-made revolvers were imported and used by both sides. The French Lefaucheux "pin-fire", which took a special .45 caliber cartridge, armed many Federal troops in the Western theater. The Confederates purchased several thousand 5-shot "Kerr" revolvers, and a number of other types as well. The best-known of these, however, was the LeMat Revolver. Developed in pre-war New Orleans, Louisiana, by Dr. Alexander LeMat, this pistol fired nine .42 caliber bullets in addition to a .63 caliber shotgun charge. Although a colorful pistol, and associated with such personalities as Confederate generals P.G.T. Beauregard, J.E.B. Stuart, and Captain Henry Wirz, relatively few were manufactured. Production problems proved difficult to overcome, and less than 3,000 were produced in France and England. Another Confederate firm, Spiller and Burr, produced a solid-frame Whitney pattern .36 caliber revolver. They made around 750 brass-framed copies in Atlanta. Production was unbearably slow, however, and the Confederate government bought the facility and moved it to Macon. There, another 689 guns were completed before December of 1864. By December of 1864, arms were no longer in short supply. The production ability of Northern industry, coupled with massive importations of arms by both sides, led to a surplus of Civil War-era small arms that existed well into the second decade of the twentieth century. Even now, weapons from the era are occasionally discovered. If you find one, treat it carefully. The last shot of the Civil War may not yet have been fired. See also Civil War Firearms and Small Arms: The Rifles and Revolvers and Civil War Weapons, Firearms, and Small Arms. Recommended Reading: Arms and Equipment of the Civil War. Description: Enhanced with marvelous illustrations, the text describes what materiel was available to the armies and navies of both sides — from iron-clad gunboats, submarine torpedoes, and military balloons to pontoon bridges, percussion grenades, and siege artillery — with on-the-scene comments by Union and Confederate soldiers about equipment and camp life. Includes more than 500 black-and-white illustrations. RATED 5 STARS. Sources: Bertram Barnett, Gettysburg National Military Park; Albaugh, William A., III, Hugh Benet, Jr., and Edward N. Simmons, Confederate Handguns. Philadelphia: Riling and Lentz, 1963; Edwards, William B., Civil War Guns. Secaucus, N.J.: Castle Books, 1978; Fuller, Claud, The Rifled Musket. Harrisburg: 1958; McAulay, John D., Carbines of the Civil War, 1861-1865. Union City, Tennessee: Pioneer Press, 1981; Mitchell, James H., Colt, the Man, the Arms, the Armory. Harrisburg: 1959; Woodhead, Henry, ed., Echoes of Glory: Arms And Equipment Of The Union and Echoes of Glory: Arms And Equipment Of The Confederacy. Morristown, N.J.: Time-Life Publishers, 1991; National Park Service; Library of Congress; Official Records of the Union and Confederate Armies.